I may have been expecting too much, but this flip mat was a bit of a let-down. This is a great and "realistic" watch station from a fantasy perspective. Side #1 is a small fort and side #2 is a small prison/dungeon. 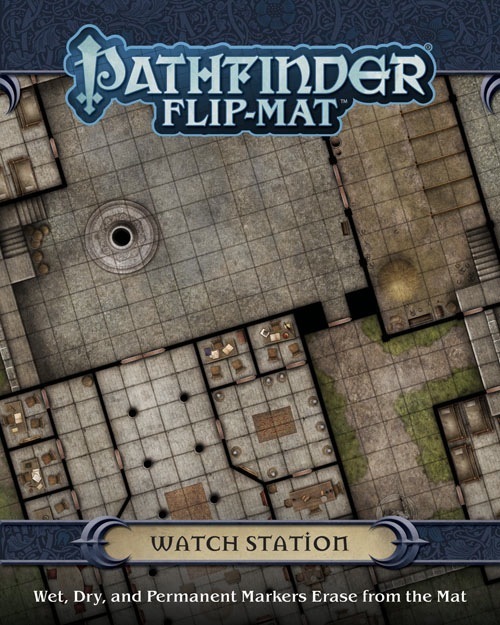 This flip map is versatile and can be used for locations other than a watch station. 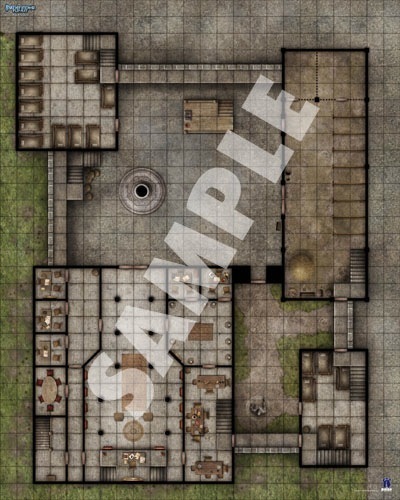 I believe Paizo is now using a new laminating material for the flip-maps. The new lamination is less rigid, so it should be easier to use on a gaming table. There were some concerns about the durability, but this map seems durable to me. This is a good change. Great map, looking forward to more! I would like to know what the differences are between the two sides. Me too. 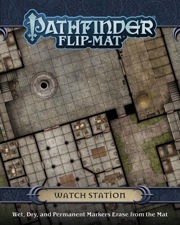 Is it two levels of the same watch house (a la the pathfinder lodge flipmat) or two distinct watch stations? I'm a big fan of these urban-based flipmats, personally. This Flip-Mat features the same watch station. 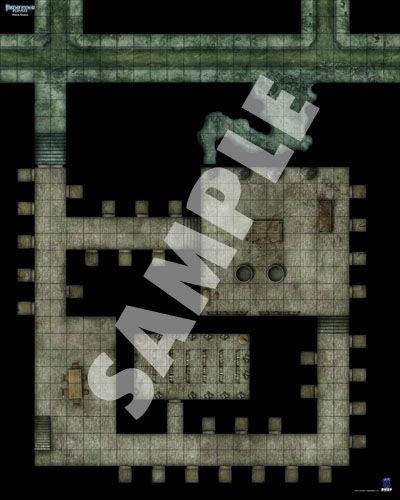 One side features the ground levels of the watch station and the other side has a basement, armory, and prison level. I love these flip-mats and map packs. Very useful for off-the-cuff locations when the PCs go left instead of right on the plot line. Cover image and product description updated to final. 1) FM:Town and MP:Shops; FM:Pirate Ship and MP:Ship's Cabins, where the map pack allows you to expand on the flip-mat. 2) FM: Warehouse and FM: Pub Crawl, where two flip-maps can be put together to create a single large scene, and it looks like it's supposed to be a single large scene. 3) Now this, where MP: Sewers can be used to expand on this Flip-Mat. I really like the idea of synchonized design on these accessories. Keep up the good work! Silly question. Im interested in maybe using this map as some sort of fort? Where is the entrance located? The best forts don't have an entrance! But you could just say its underneath one of the stone walls to the left or the two to on the bottom right and just say there's a walkway overhead. On the bottom right of the map (using the orientation of the sample map above) there is an outer courtyard with a statue, paths, and grass. The path that leads to the wall section between the stable and the barracks is the entrance to the watch station. The map shows the walkway, but there is a gate under the walkway. At least there was in my imagination when I designed the map. Kudos for this design - I think it's my favorite in the line so far. Looking over it I had about four or five great ideas for scenes/adventures - that creative spark being one of the big reasons I subscribe to them. Are they made out of new cardstock? Or is their 'softer' feel perhaps a function of being stored/transported differently now? This is the first flip mat packaged with the new wraparound sleeve. What I didn't see anywhere was the mention that the mats themselves have also changed with this release. The flip mats are now printed on thinner stock and I'm not sure that I like the change. The flip mats are now printed on thinner stock and I'm not sure that I like the change. Someone gave the amazingly done flip mats for Thornkeep a lower review based on the thinner stock too but I can’t figure out what the concern is. I took out an older mat and compared them; the new ones are obviously thinner but seem just as sturdy overall, work the same and have great art. They actually lay out a little flatter on the table too. I’m not disagreeing with you per se I just wanted to know what your concern is. I actually like the change...so far. The new stock is a bit more flexible and I can see that actually improve on the durability of the maps - some of the older maps I have look a bit battered around the folds and that 'may' be avoidable with the new ones. I will wait and see. 1. Durability over time. I probably own fifteen of these guys, and some of them -- especially the ones that show up in PFS scenarios often -- really get put through their paces. 2. The unpleasant prospect that there may have been a deliberate shift to lower quality card stock, though I hope (and suspect) that this is not the case. Personally, I noted the change, but I'm waiting to see how the new maps hold up. The change in paper stock was not by our request. We're inquiring with the printer. Kudos as well, I think this has been one of my favorite maps this year to hit shelves. Honestly I really wish this map had another map tile set to go with it for the station proper above it so I could put some extra floors on the upper level. That being said I do have to wonder how they would get horses into and out of the barracks from that position without squeezing them. Is this on the docket to be reprinted? Just wondering about this? Short answer: Not currently, but that doesn't mean it won't happen. Long answer: Pretty much every* out-of-print non-Basic Flip-Mat has the potential to eventually reappear as part of the Flip-Mat Classics line. At the moment, though, we have announced all of our product releases through July and most of August, and no new Flip-Mat Classics are scheduled for release between now and then. Ok, not every one has the potential to reappear: The Flip-Mats published by Steel Sqwire in 2006 before Paizo acquired the brand—Forest Path, City Square, and the original Dungeon—are not up for consideration. Thank you for the thorough update, i was wondering about new Classic flip-mats appearances.